I was recently told that I may be eating too much kale. It took a lot out of me to type that sentence up there. I feel a near-religious reverence for kale. Too much? How could I be consuming too much? As it turns out, consuming excessive amounts of any cruciferous vegetables (kale, broccoli, cauliflower, bok choy, and cabbage) can cause hypothyroidism. Those with iodine deficiencies are at highest risk, however. There are chemical components found in kale that can compete with iodine for uptake by the thyroid, causing competition between the two. Upon hearing this painful news, I quickly checked back into reality and remembered how wholly we believe in balance. With a balanced diet including adequate amounts of iodine (from sea vegetables, cranberries, navy beans, etc) consumption of our favorite cruciferous veggies should not cause any harm. Onto the kale I go. All of that being said, this salad is mostly about the dressing. It would make a salad of cotton balls appetizing. Crisp basil leaves are key. There are many varieties of basil. Christmas basil is fruity and less sharp in flavor when compared to spicier cinnamon basil. Sweet basil would be perfect for this recipe as it pairs well with most ingredients used in Italian cooking. Sweet Thai basil has a delicate anise flavor that, if used in this recipe, would be great over grilled eggplant and zucchini. Pearlie bought 4 different kinds of tomatoes for this salad. 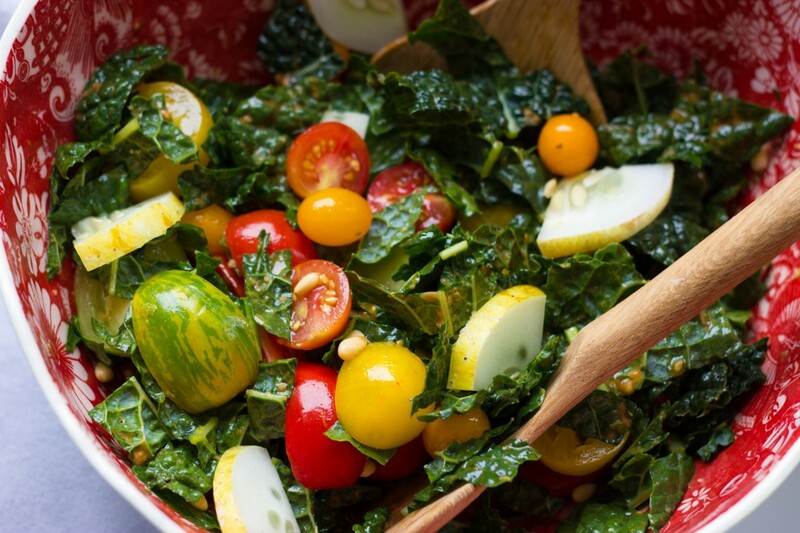 Dense and sweet baby heirlooms, little baby red and golden cherries, and juicy plum tomatoes all make for a lovely array of colors in this salad. 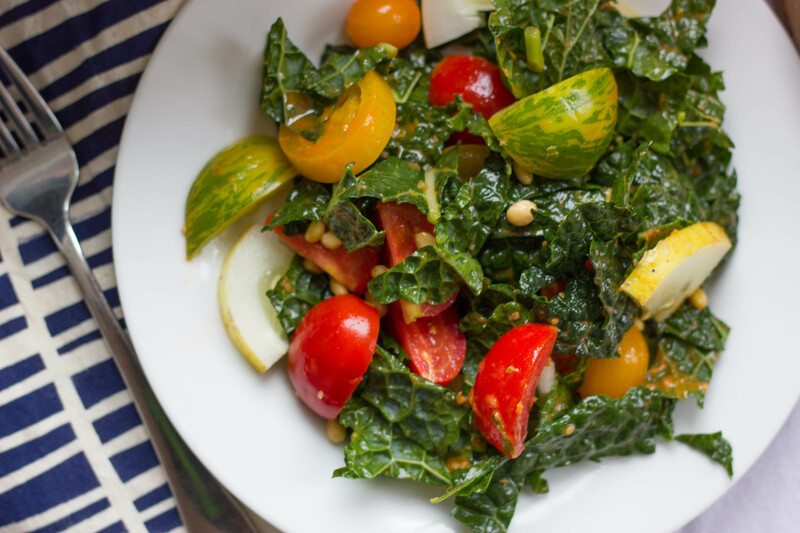 Chop the kale, removing the stalks if you don’t like them, and with your hands, rub 3 tablespoons of the dressing into the kale and set aside. 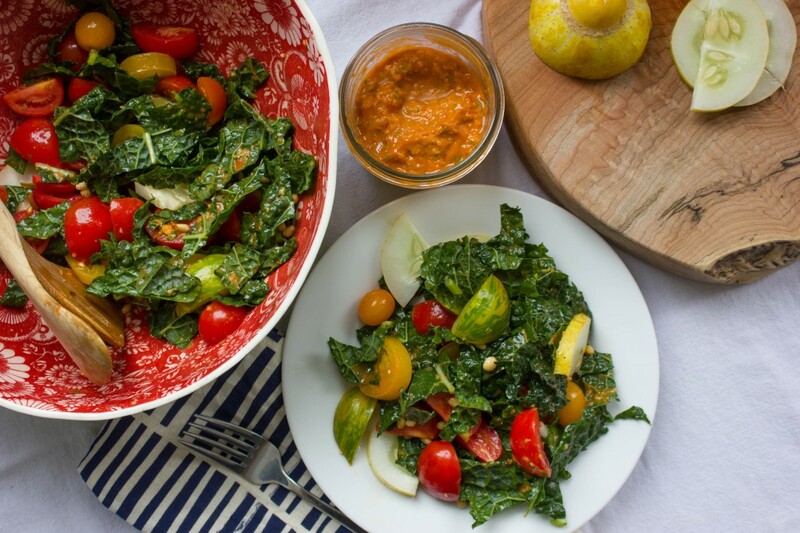 Chop the tomatoes and the cucumber, then add to the dressed kale. Finish with 1-2 tbs. 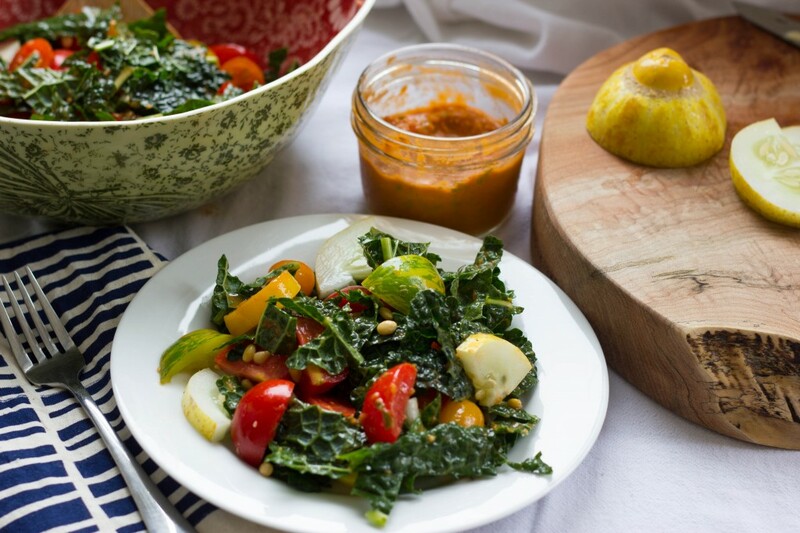 of dressing and the toasted pine nuts, then enjoy! Combine all the ingredients in a food processor or blender until processed. 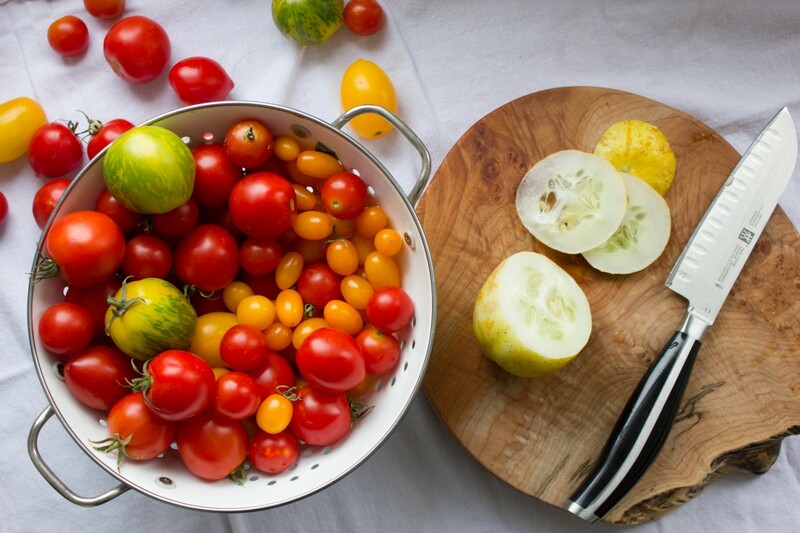 Store in a closed container and will last for up to a month in the refrigerator. Cheat Sheet: To make this a main salad, add your favorite type of beans. Navy beans would be lovely as they will provide you with iodine as well.